Tankionline.com historical owner info, name servers, Analytics ID, Adsense ID, Addthis ID, advertisers, screenshots, meta tags, whois, site and server info. 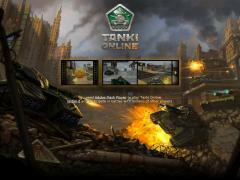 Welcome to Tanki Online — the first multiplayer Flash 3D-action! Come join us in furious battles — destroy enemy tanks, help your team, improve your tank and skills, and make your own military career! Sites related to Tankionline.com based on metadata.